A research team from City University of Hong Kong (CityU) has tackled this problem in a precise and systematic way by developing a new device, and has recently published their findings in a research article on the journal Nature Communications, titled "High-throughput three-dimensional chemotactic assays reveal steepness-dependent complexity in neuronal sensation to molecular gradients". "Our chip measures only 1 by 3 cm2, but houses hundreds of suspended microscale hydrogel cylinders, each containing a distinct gradient profile to allow 3D growth of neuronal cells in an environment closely resembling that inside our brains," says Dr Shi Peng, Associate Professor in the Department of Biomedical Engineering (BME) at CityU, who led the research. 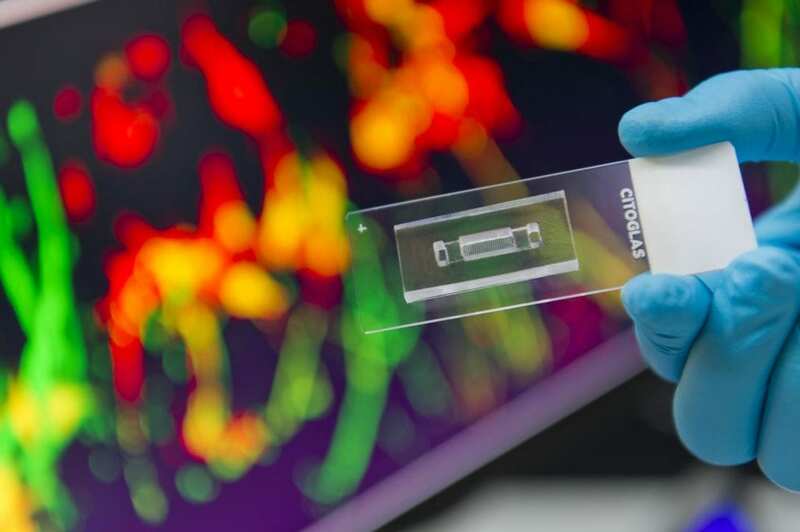 "The major advantage of the setup is the high throughput, meaning a large collection of molecular gradient profiles can be tested in parallel using a single chip to generate a huge amount of data, and the experiment time can be reduced from months to 48 hours," he explains. "In case of brain injury, the nervous system does not regenerate easily, so proper use of guidance molecules would help the brain to recover. In this regard, our research provides insights to the development of novel therapeutic strategies," Dr Shi concluded.